Bonus: 20% Discount on Pre-sale. Pearl Pay is a FinTech company that helps small banks, financial institutions and MSMEs (Micro, Small and Medium Enterprises) to offer secured mainstream & innovative banking services. Pearl Pay aims to be the national payment gateway of the Philippines, by providing world-class yet affordable banking applications, designed to interconnect the entire banking and payment industries in the Philippines. Pearl Pay is a Virtual Money Logistics System that provides worldclass and yet affordable mobile wallet white-label service for rural banks. 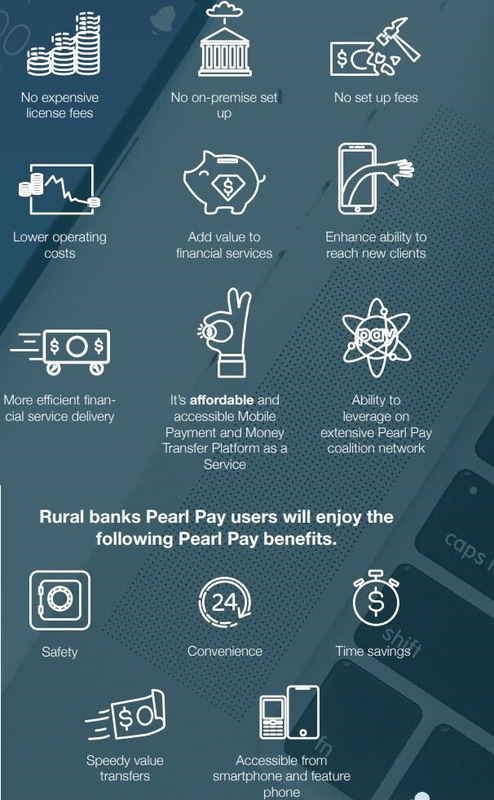 Using the latest technology, Pearl Pay will allow rural banks to launch their own virtual prepaid mobile wallet as fast as 30 days. More than just a virtual prepaid mobile wallet, Pearl Pay is a platform into which an extensive range of third-party services will be integrated including domestic/international money remittance, cryptocurrency exchange, and innovative payment solutions; empowering rural banks, OFW (Overseas Filipino Workers) and MSMEs (Micro, Small and Medium Enterprises). Pearl Pay will be expanding its international remittance services to Hong Kong, Singapore, Japan, Middle East and the United States of America in the coming years. MatchMove enables companies to offer a fully branded secure mobile wallet solution, increasing revenue and user engagement. MatchMove Wallet OS™ is built with the vision of strengthening financial inclusion through enabling its Spend, Send, Lend™ capabilities across developed and developing markets. MatchMove Wallet OS enables any company to easily offer their customers a fully branded, secure mobile wallet solution that includes P2P transfer, Cross-Border Money Transfers, Top Up channels, Virtual Payment Cards, Loyalty Points & Rewards, Promotions & Offers amongst many other features. Wallet OS fully customizable platforms are cloud-based and PCI-DSS compliant. Instead of building the backend from scratch, setting up an on-premise servers and payment HSM (Hardware Security Module), and get PCI DSS (Payment Card Industry Data Security Standards) certification, it will take about 18 to 24 months before we can go live. Partnering with MatchMove will allow Pearl Pay to go live as fast as 6 months. Komodo Platform shines on settling existing socio-economic issues through decentralized technologies and paving the way for a thriving society. They offer white-label services, a structure for decentralized applications, and different plug and play solutions for both businesses and developers. The platform boasts an array of features that range from security and privacy to scalability. They have already made leaps with at-pegged assets and blockchain interoperability. Their strength lies in their capability to seriously follow the latest directions and examine what other projects are advancing within the blockchain industry. Most recently the team was researching micropayment channels based on Bitcoin’s Lighting Network and finding into ways to provide language agnostic simple as well as smart contracts. Partnering with Komodo will allow Pearl Pay to raise funds through dICO (Decentralized Initial Coin Offering) and springboard the product development of its blockchain-based products. Creo is an online business solution platform that helps MSMEs (Micro, Small and Medium Enterprises) to have an online presence and thrive in the digital economy by providing an online marketplace to retailers and booking reservation platform for service-oriented businesses such as salon, spa, and restaurant in just a few clicks. Through a partnership with Pearl Pay, it empowers the MSMEs to accept electronic payments. As shown above, 79% of the banks in the Philippines are rural banks. Only big banks and a handful of thrift banks are members of a foreign payment network such as MasterCard and Visa. Bancnet is a Philippine-based interbank network founded in 1990. Despite operating in almost three decades, it only has a mere 6% market penetration for rural banks. 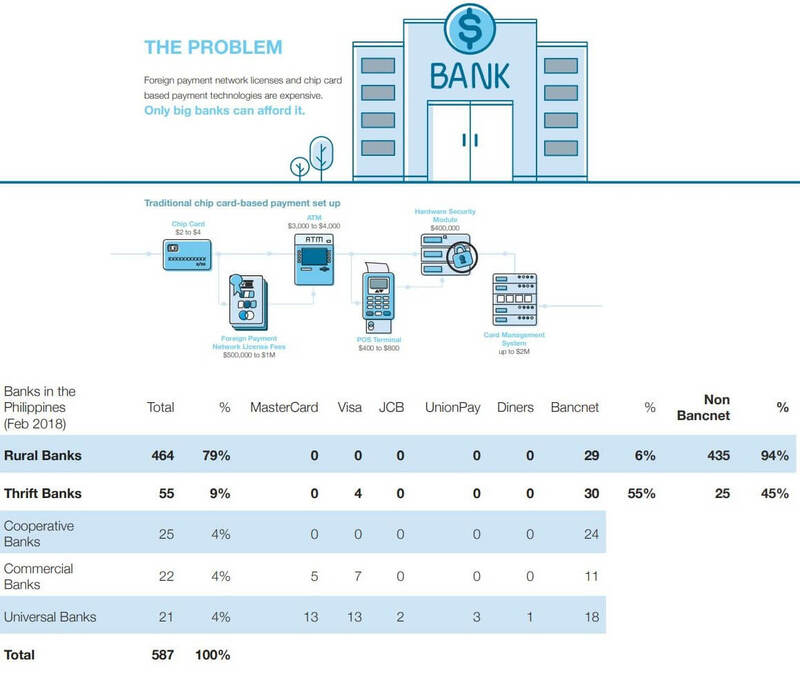 A staggering 94% rural banks do not have access to E-Money (Electronic-Money). Almost all E-Money transactions in the Philippines use the capital-intensive chip card-based technologies. Pearl Pay Pera Express Strategic Outlet (PESO) is an innovative product designed to transform micro, small and medium enterprises with existing stores like the sari-sari store (neighborhood sundry store), pawnshop, barber shop, pharmacy, gasoline station and other similar types of businesses to become a money remittance agent. Pearl Pay Remit will be using the Komodo Blockchain Platform. Komodo provides a framework and a white-label blockchain service that allows Pearl Pay to issue its own coins (i.e. PRLPAY Coin). PRLPAY Coin shall be used as a medium of exchange which will allow our OFW to convert their fiat currency into PRLPAY Coins, Pearl Pay Exchange shall immediately and automatically convert the OFW PRLPAY Coins into the Philippine peso equivalent. To date, a total of four companies expressed interests to launch their ICO through Pearl Pay Exchange. A UK-based company, a US-based company, and two Philippine-based companies. In partnership with Komodo, Pearl Pay Exchange will be able to offer Notarization Nodes for dPoW (Delayed Proof of Work) to secure the asset chains of the ICO listed companies created within the Pearl Pay Exchange ecosystem. PRLPAY coin is the energy that will propel the services of Pearl Pay Exchange provides. More than just the exclusive cryptocurrency for Pearl Pay Remit accountholders, PRLPAY coin will be utilized as an accepted cryptocurrency for companies that will launch an ICO through the Pearl Pay Exchange platform. Furthermore, PRLPAY coin will be the preferred cryptocurrency to employ Pearl Pay Exchange Notarization Nodes Service.